"Is this a pretext not to carry out political reforms? On the contrary!" Russian President Vladimir Putin demanded that Ukraine to implement the political part of Minsk agreements, despite the continuing attacks in Donbass. "Postponing these issues, referring to the acts of violence in the demarcation zone is just a pretense, an excuse to do nothing. 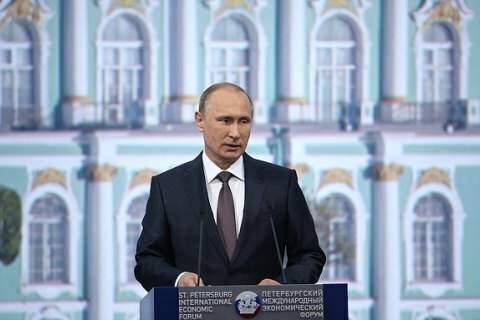 Putin said at the St. Petersburg International Economic Forum on 16 June. "Both sides accuse each other of shooting. And who said it’s the separatists who shoot? They say it is the representatives of the Ukrainian authorities, Ukrainian army that shoot." "Is this a pretext not to carry out political reforms? On the contrary!" Putin assured. According to him, political articled of Minsk agreements have the priority in in Donbas peace settlement. On June 15, Ukraine at a meeting of the Trilateral contact group on Donbass urged to investigate all cases of attacks in Donbass. Ukrainian side insists that the political process can begin only after a full ceasefire and the withdrawal of heavy weapons.